WARNING: Some of the images within this article may be disturbing for a younger audience. How did plantation owners and northern industrialists, yeoman farmers and slaves, and women and children experience the Civil War and the enormous social and political changes it wrought? Though the Civil War is the most written-about episode in American history, politicians continue to debate its legacy and historians continue to uncover rich new details and narratives. Recently a handful of scholars (perhaps influenced by studies of the impact of television on the Vietnam War) have sought to explore the relationship between the Civil War and the photographers and photographs that documented the conflict and its aftermath. This article aims to summarize and synthesize much of this material in order to elucidate how photographs influenced Americans at war and on the homefront, and how they can enrich our present understanding of the Civil War. The Library of Congress’ extensive collection of digitized Civil War photographs can be found here. Also, check out the website of the Center for Civil War Photography and its Guide to Finding Civil War Photos! Brady, Mathew B. 1875. Library of Congress Prints and Photographs Division Washington, D.C. 20540 USA. In 1839, Louis Daguerre and Joseph Nicéphone Niépce developed the daguerreotype, which used silvered copper plates to record real-life images for the first time. Almost immediately, entrepreneurial artists saw an opportunity to create innovative art and make money. Likewise, it wasn’t long before photographers documented scenes of conflict—the Mexican-American War was the first to be photographed, though the pictures never reached the general public, and thus had almost no cultural impact. The 1850s were arguably the “golden years of the daguerreotype,” as practitioners opened hundreds of studios and honed their techniques as they documented more and more natural phenomena and major news events. The new wet plate process introduced in the 1850s reduced necessary exposure times and made replication of negatives far simpler. As improvements in technology rapidly accelerated, popular interest in photography grew exponentially. Photographers began to produce stereoscopic view cards, which could be produced on a mass scale and came close to displaying a three-dimensional image. These became wildly popular. Aided by new mail-order catalogs, people began to collect them. As opposed to paintings, photographs were relatively affordable, and ordinary Americans were able to commission family portraits. Not only was this a good business opportunity, but he genuinely believed that “The camera is the eye of history,” and aimed to preserve these images of the wealthy and important for posterity. Mathew Brady, N.Y. 1860 February 27. Published in: Lincoln’s Photographs: A Complete Album / by Lloyd Ostendorf. Dayton, OH: Rockywood Press, 1998, p. 34-5. Library of Congress Prints and Photographs Division Washington, D.C. 20540 USAAbraham Lincoln, candidate for U.S. president, three-quarter length portrait, before delivering his Cooper Union address in New York City. To learn more about Lincoln’s Cooper Union speech and his presidential campaign, listen to this National Public Radio interview with Harold Holzer, author of Lincoln and Cooper Union: The Speech That Made Abraham Lincoln President. Thus, most photographers set south in pursuit of profit. Atlanta, Georgia. 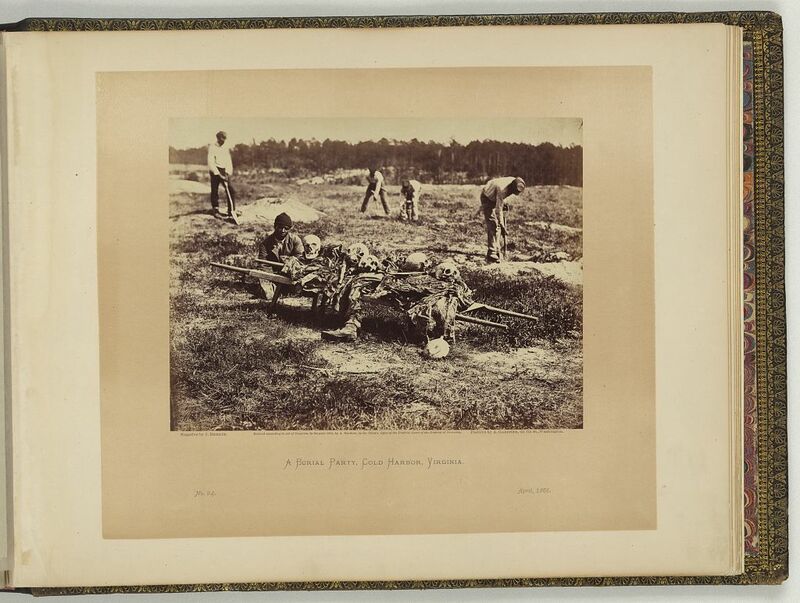 Confederate fortifications (George N. Barnard, photographer and his dark room). Library of Congress Prints and Photographs Division Washington, D.C. 20540 USA. That Brady (and others) requested and received permission to follow the Union troops into battle was revolutionary. Perhaps Lincoln maintained a soft spot for the photographer who assured his ascendance to the presidency, or perhaps he and other government officials appreciated the historical value of documentary photography. Either way, the intrepid photographers were subject to much of the same mortal danger, inclement weather, and dreadful living conditions as the combatants. They developed their negative on the move, in “Whatsit Wagons” and other portable darkrooms, as in the photo above. They often operated as part of larger studios; for example, thousands of photos were marked “Photo by Brady” but were taken by his many assistants and employees—strong intellectual property laws did not yet exist. The romance of war lost its floss for many as they viewed the snarl from beneath overturned carriages and buggies. Photograph from the main eastern theater of the Civil War, Bull Run, 2nd Battle of, Va., 1862, July-August 1862. View on battle field of Antietam where Sumner’s corps charged the enemy. Scene of terrific conflict. Stereograph showing devastation after the battle with dead soldiers on the battlefield and a wagon in the background. Incidents of the War. A Harvest of Death, Gettysburg, July, 1863. Washington, D.C. : published by Philp & Solomons, 1865. Robert H. Kelly, Union soldier, full-length portrait, standing, facing left. The Battle of Antietam was the single bloodiest day in American history—and provided the first of many pictures of “corpse-strewn fields” to match. Only one “action shot” was taken during the Civil War, at the Battle of Antietam in 1862. The exposure times necessary for the wet plate process were too long to stop motion. Often photographers took “studio-style” portraits of soldiers, like the photo above, which they sent back to their families. In fact, from the moment Union soldiers began to congregate in Washington, D.C., photographers were swarmed with requests for cartes de visite to send home. As young men went off to war, a photograph “became an essential keepsake…for those staying at home,” as well as for the soldiers themselves. How Sherman fixed the railroad so the “Johnnies” could not use it. Sherman’s march to the sea. Federal troops occupying a line of breastworks on the North Anna River, VA. Stereograph showing Union soldiers in fortified trenches. On William Tecumseh Sherman’s “March to the Sea,” soldiers destroyed crops, homes, and, most importantly, civilian infrastructure and transportation systems. Photographs of the destruction only compounded the economic hardships and psychological trauma that southerners suffered at Sherman’s hands. Also, these photographs provided essential visual context. In an age when cross-country travel was rare, these images were eye-opening. The landscapes underscored the war’s profound consequences, for American citizens and American soil. Dead Confederate soldier as he lay on the field, after the battle of the 19th May, near Mrs. Allsop’s, Pine Forest, 3 miles from Spottsylvania [i.e. Spotsylvania] Court House, Va. Library of Congress Prints and Photographs Division Washington, D.C. 20540 USA. Images of dead soldiers were even more impactful. In fact, not infrequently photographs rearranged the corpses in order to create more dramatic images. Visitors flocked to Brady’s gallery in droves. Many even sought to identify their own missing loved ones in the piles of dead bodies, though most were unsuccessful. Antietam, Maryland. Dead soldiers in ditch on the right wing where Kimball’s brigade fought so desperately. (1862) Unidentified soldier of Company G, 147th New York Infantry Regiment, with amputated arms] / Fredricks & Co., 179 Fifth Avenue, Madison Square, New York. (1861-1865). Certainly dead bodies proved useful subjects because of their stillness, but the photographers, too, were seized by a morbid fascination with this death on an unmatched scale. These photographers, though they neither killed nor died in war, became part of “the work of death” that Faust describes. Just as the Civil War modernized the economy, it modernized culture, even if its effects took time to manifest themselves…It eroded Victorain habits of feeling and sentimentality. As Edmund Wilson argued, the war chastened American language, making it sharper, more concise, more pungent. The war stripped away illusions. This scourging was accelerated by a flourishing new medium: photography. Photography complemented—and competed with—old discursive methods of verbal description by bringing a visceral immediacy to an audience avid for images. Photographic images became the connective tissue binding the home front to the combat zone. And in a society anxious about its very survival, portraits of statesmen and generals provided reassuring testimony of steadfast character; Lincoln used photography to assert his leadership over a fractious polity. When Mathew Brady exhibited “The Dead of Antietam” in the fall of 1862, the horror and pit of war disoriented Americans. Sensation was replacing rationality in the public’s mind. In the writings from The Atlantic and photographs from the National Portrait Gallery in the pages that follow, one can see a people grappling to make sense of life in the cauldron of war. And one can see, in hesitant and undeveloped ways, the emergence of the modern United States of America. Gardner’s photographic sketch book of the war. Washington : Philp & Solomons, . Library of Congress Prints and Photographs Division Washington, D.C. 20540. Despite their morbid content, sales of war photographs actually peaked after the South surrendered at Appomattox. A group of “contraband.” Stereograph showing a group of seven African American men, former slaves, dressed in old Union uniforms standing in front of a wagon and shack. Library of Congress Prints and Photographs Division Washington, D.C. 20540 USA. Furthermore, photographs showcase many more people—and more diverse people—than were ever able to write down their impressions and experiences of war. By adding more faces to the historical record, they help us expand our understanding of history and whose stories should be included. Especially since the Confederacy deliberately privileged the opinions and narratives of the wealthy, white planter class at the expense of everyone else, this endeavor becomes particularly important as a source for relics of the Civil War. Though a photograph is a record of a time long past, it is a three-dimensional object, and its continued presence thus allows past events to be repurposed and contextualized anew. Every moment can be reconsidered in an ever-changing present. As historians uncover more and more about the Civil War, interpretations of these photographs and their significance will shift, as well, always continuing to enrich our understanding of this essential episode. Unidentified soldier in Union uniform, unidentified woman, and unidentified baby] / Newcomer’s Gallery, 508 No. 2nd St., Phila. Library of Congress Prints and Photographs Division Washington, D.C. 20540. Two soldiers identified as Wesly Scott and L.P. Nash in Union uniforms and Ohio Volunteer Militia belt buckles with muskets. Library of Congress Prints and Photographs Division Washington, D.C. 20540 . Unidentified African American soldier in Union corporal’s uniform. Library of Congress Prints and Photographs Division Washington, D.C. 20540 . African American soldier in Union infantry sergeant’s uniform and black mourning ribbon with bayonet in front of painted backdrop. Library of Congress Prints and Photographs Division Washington, D.C. 20540 USA. Unidentified soldier in Union uniform with wife and daughters holding saxhorn between 1861 and 1865. Library of Congress Prints and Photographs Division Washington, D.C. 20540. Unidentified boy holding 34-star flag. ninth-plate ambrotype, hand-colored ; 7.5 x 6.4 cm (case). Library of Congress Prints and Photographs Division Washington, D.C. 20540 . African American soldier in Union uniform. Between 1863 and 1865. LOC.